Banarasi was the fashion buzzword this year. Once an important part of the wedding trousseau, Banarasi saris are usually stuffed in trunks and not worn for years. But thanks to the concentrated efforts of designers to revive the weave and all the buzz around Indian textiles, donning a Banarasi sari is now a classy statement. Banarasi has also been the theme at most major fashion events. Be it the grand closing of the Delhi fashion week with 16 blue-chip names from the fashion fraternity collaborating to present the Banarasi weave with a modern look, the Mumbai fashion week, or the show organised by the ministry of external affairs for the First Ladies of Africa visiting Delhi. Even Modi presented the fashionable Michelle Obama with a Banarasi sari. Throughout the year, various ministries and the fashion fraternity came together to revive the Banarasi handloom industry. On occasions where Banarasi took the centre stage, it was interesting to note that it wasn't only the models donning the Banarasi fabric. Many among the guests flaunted the silk and zari drape. Those who have an elaborate variety of Banarasis in their wardrobe are taking pride in their collection that they have treasured for years now. Says danseuse Geeta Chandran, "My mother has an exquisite collection of saris, and one of my saris is now almost 55 years old. My love for Banarasi saris has only grown over the years, and though it is Kanjeevarams that are a must for south Indians, I have a good collection of Banarasis for every occasion. For most family functions, where I know everyone will turn up in a Kanjeevaram, I prefer a Banarasi, just to stand out. One good thing about Banarasi is that it is available in silver zari, not just gold. In the last few years, the focus on Banarasi is back and there is a wide variety available now." Shovana Narayan reveals that the oldest Banarasi in her collection is a yellow and green sari gifted to her by her mother, and that it was bought in 1948-49. Shovana shares that her winter wardrobe mostly has Banarasi saris and that she loves them for their "delicate designs and intricate zari work." She says, "In the last few years, I haven't bought any sari for myself. Most of the saris that I wear now have been gifted to me as guru dakshina and some of them are Banarasi saris. They are not as heavily-laden with zari work as they used to be in older days, and can be worn as evening wear." Neelam Pratap Rudy, who attended two fashion events dedicated to the Banarasi weave, says, "At one of the events, there were other bureaucrats' wives from Delhi attending the functions and all of us decided to wear Banarasi saris. I have a huge collection for all occasions," she says. In June, members of the fashion fraternity, textile manufacturers and weavers got together in Banaras to discuss the revival of the Banarasi handloom industry. Shaina NC roped in designers like Ritu Kumar, Manish Malhotra, Sandeep Khosla, Shruti Sancheti, Anita Dongre and Rina Dhaka to be part of the campaign to design, manufacture and produce textiles in Banaras. The designers also asked for the government's support to promote Banarasi saris and other handloom products. In August, the fashion week at Mumbai saw many designers come together to present their interpretations of Indian fabrics on Handloom and Textiles Day. Ritu Kumar showcased her Banarasi weaves collection. Her initiative to honour weavers from Banaras was supported by the Ministry of Textiles to revive handloom weaving in the city. At the Delhi fashion week in October, the finale was curated on the theme 'The Banaras project - crafts of India', and 16 designers presented their interpretations of the Banarasi weave, and its journey from being used as traditional wear to now finding a place in contemporary fashion. The opening show also brought Banarasi silk into the limelight. Soon after that, in October, a show was hosted for the First Ladies of Africa visiting Delhi, to present to them the best of the Banarasi weave, with the theme 'Threads of Banaras'. After showcasing it to a select audience, the collection was again presented to the public in November. 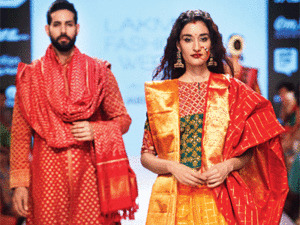 The Development Commissioner of Handlooms and the Ministry of Textiles, in association with the Fashion Design Council of India (FDCI), organised a show to promote Banarasi textiles. "We have to revive the Banarasi weave in line with modern sensibilities. We are sure that our efforts will set new benchmarks for such concepts in the future," says Sunil Sethi, president, FDCI. Vaishali S has also created an entire collection based on the weaves of Banaras. She says, "When the entire design fraternity comes forward and highlights the fabric, it helps create awareness among people. They are now understanding that a Banarasi shouldn't sit in a wardrobe only as a sari, when it can be worn in many ways. When it comes to saris, the trend, in the last few years, has shifted from embroidery to fabrics, says designer David Abraham of the duo Abraham and Thakore. "With all the buzz around Banarasi and efforts to revive the fabric, Banarasi saris are once again popular. In the last 10 years, there was an explosion of embroidery in wedding wear, everything created was with embroidery. But with so much activity happening around Indian weaves and textiles now, there is an awareness and people are choosing fabrics like Banarasi more often and not just for weddings," he says. Designer Payal Jain says that concentrated efforts of designers are helping in the revival of ancient craft traditions. She says, "We all have to make efforts to promote our fabrics in India and globally. As a designer, there is so much one can do with Indian craft. A modern interpretation of our textiles and craft can make way for their revival." Namrata Joshipura says that it isn't just saris, even the contemporary look that she created with Banarasi is proving to be a great commercial success. "Banarasi as a fabric is gaining popularity among the young. The biggest example is that the long Banarasi jacket with a shift or an overlap is in demand, and we are looking at creating more such designs. It has taken years of effort and hard work for designers to make Banarasi a style statement," says Namrata. Adds Vaishali, "The Banarasi weave isn't only limited to a sari. Designers today are creating a modern version of it by draping or constructing it in unconventional silhouettes." Designer Gaurang Shah says that the antique look that the older Banarasi saris have, cannot be achieved with today's zari, "so it is actually flaunt worthy to have an old Banarasi and wear it as a dupatta or get a jacket made of it." Michelle Obama was gifted a banarasi during her visit here According to reports, an exquisite hand-woven Banarasi silk sari with gold and silver threads, which took weavers three months to complete, was presented to Michelle Obama during her three-day visit to India in January. The cream-coloured 'Kadhua' silk sari, an exclusive product from Banaras, was hand-woven using gold and silver threads by three classic weavers, and weighed around 400 grams. The sari costs about Rs 1.5 lakh.